Not only does the USA have its birthday in July, so do our neighbors to the north. And before the last seconds of this fine month tick away, and admittedly more than four weeks late, I thought I'd offer up Gene Marshall's touching rendition of Vincent Quaranta's thoughtful ode to his adopted country. It's clearly true that, as the words tell us, Vincent's "place" is actually in Italy (whatever that means), but he seems to consider Canada to be almost as peachy. This song and performance don't exactly inspire me to visit either Canada or Italy - it seems sort of maudlin and dreary, to be honest - but the words seem heartfelt. I really have to wonder if Mr. Quaranta was happy with this rather morose setting of his lyrics. 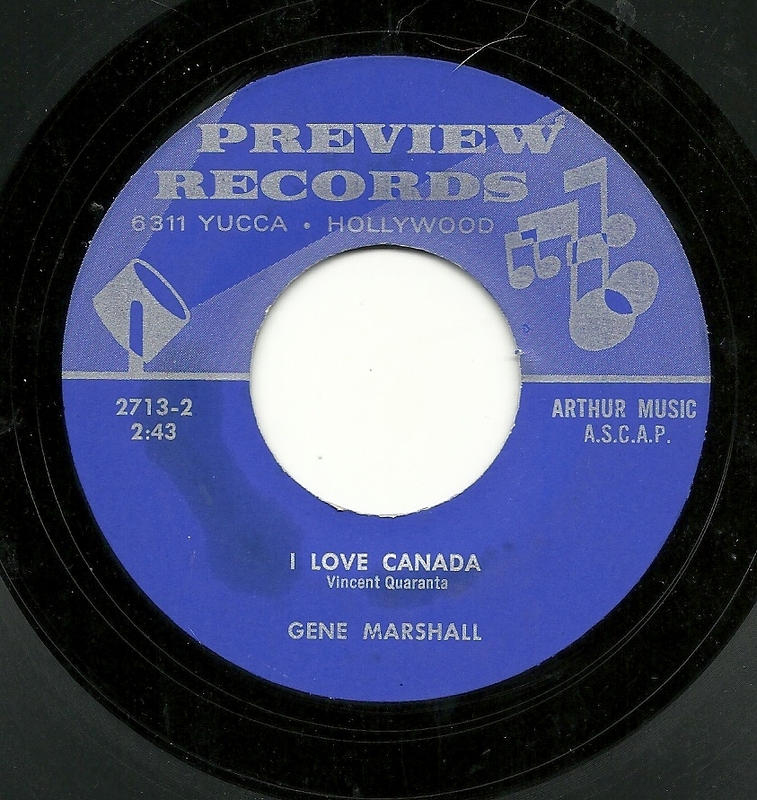 The problem was probably really with the era at the Preview label. The records made there in the mid and late 1970's (this record dates to 1976) are generally uninspired and display shoddy workmanship, and an abundance of going-through-the-motions. Their generally not even pressed well. 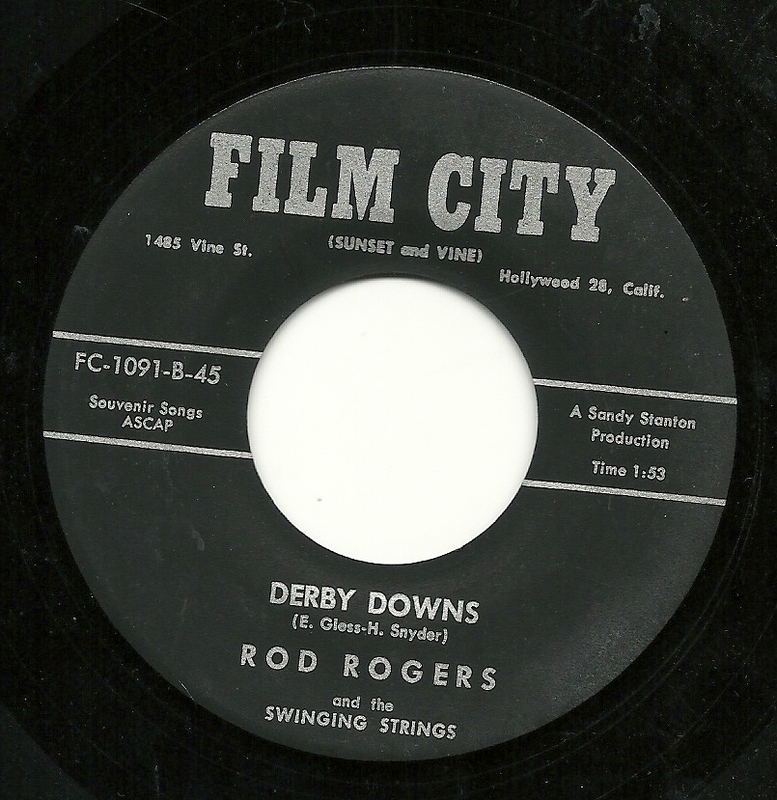 In comparison, the records made while Rodd Keith were there generally display a feel that it was a fun and interesting place to be. 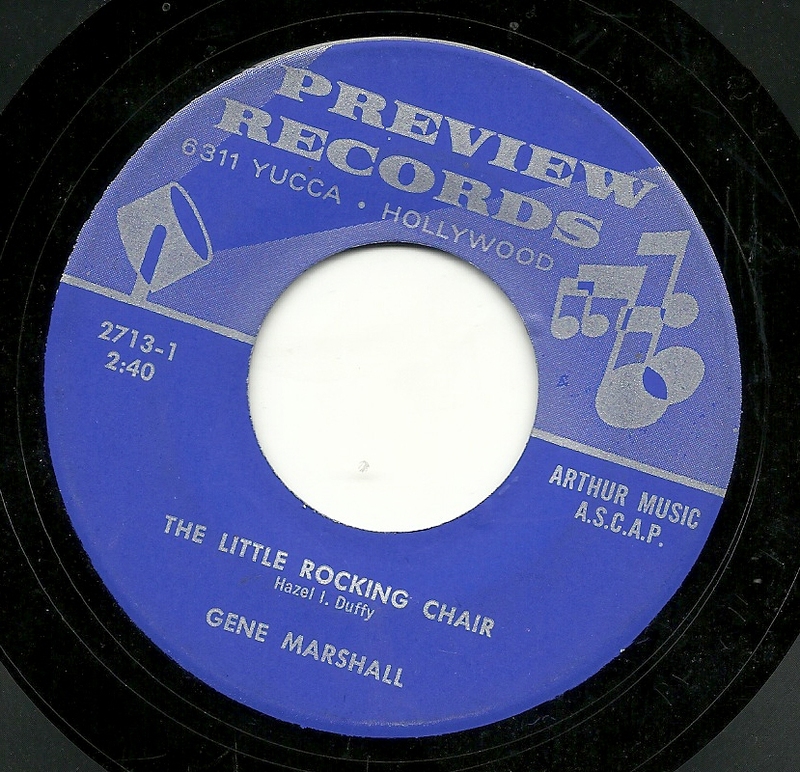 The records from later in the '70's, such as this one - both the side just shared and this one, "The Little Rocking Chair", make it sound like working at Preview was probably a chore by that point. At least, that's what most of that era's Preview records indicate to me. Last weekend, in addition to featuring the day I stopped being the parent of a teenager (as my younger daughter turned 20), also marked the 44th anniversary of the first moon landing. And in honor of that, today, we have Rod (Rodd Keith) Rogers, with his patented Swinging Strings, telling us all about the phenomenon of "Twisting on the Moon". 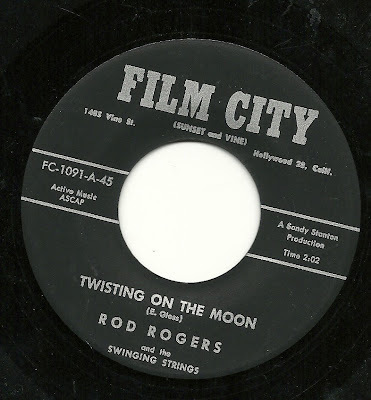 This is a typically bouncy Rod Rogers Chamberlin production, with a nice solo, and an especially great little set of lyrics, filled with fun images, such as "see ya later, at the crater" and "we'll be cuttin' capers to a crazy 'bleep bleep' tune". But the most interesting thing about this song may be that songwriter Eleanor Glass kept submitted the song to different song-poem companies. It would appear that perhaps Ms. Glass wrote the words and the music to this tune, as one of the other versions, which appeared on Cowtown, has essentially the same tune. For the time being, you can hear that one at this ebay auction (one that is, however, ended, so that link will not work at some point in the near future). And Sammy Marshall also recorded the song for Roxie! The flip side is no slouch either: It's another Eleanor Glass entry, this time a tribute to "Derby Downs", the famed home of the Soap Box Derby. And again, there are some fun lyrics: "We'll drink some pop, while our brows we mop". If you ask me (and you didn't), this is a hell of a single! Well, as you may have seen on other blogs, or learned for yourself, Divshare is back up and running. Thanks to everyone who chimed in, either with confirmations that it wasn't "just me" or ideas for other sites. By the time I had an opportunity to look more in depth at some of those other sites, the divshare folks (who were remarkably responsive, this time around) had let me know they were back in business. I've also included a bonus at the bottom for those who love the late '50's and early '60's as much as I do, and I will post again a few times in the next week in order to get caught up. Today's feature comes from a guy I've been happily corresponding with for over four months now. 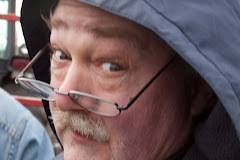 His name is Andy, and he first contacted me regarding my posts about Merigail Moreland. 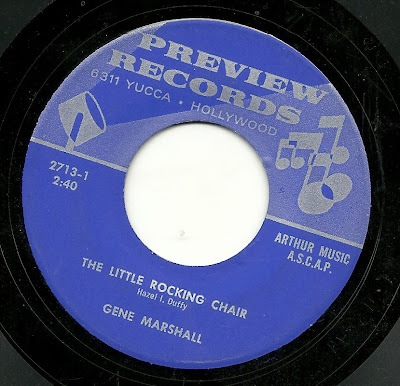 This led to a sharing of a lot of late '50's and early '60's singles through e-mail (mostly - and with great appreciation) from him to me, as we discovered where our tastes overlap, and what we have that might be of interest to each other. His interest is not really in song-poems, but as he owns some, he was nice enough to send a few my way, and so far, this is my favorite among those he's sent. 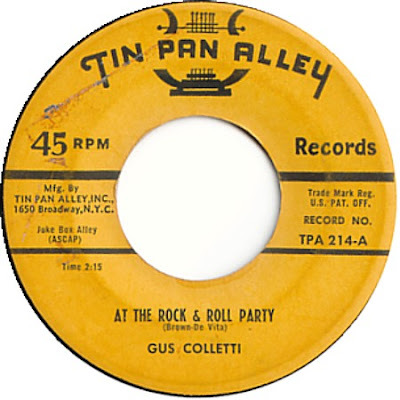 It's on Tin Pan Alley, and features Gus Colletti, whose stylings would seem to be spectacularly mismatched for a song titled "At the Rock and Roll Party". He has a choked, strained quality which seems more in tune with ballad singers, or at least dramatic readings of more serious material (not that I'd like him in that material, but at least it would seem a better match). At the same time, though, this seems to show the influence of Paul Anka, one of my least favorite singers of the era. The band is giving it their best, but the whole enterprise seems doomed to failure, due to the choice of vocalists. Still, it's fun failure! 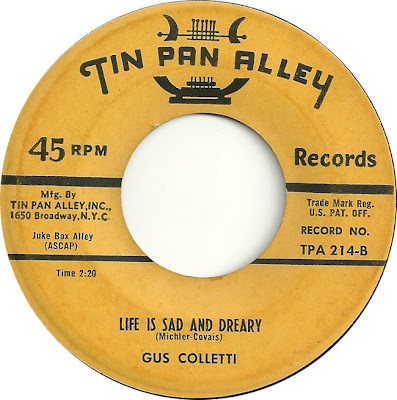 I cannot even pretend to drum up any enthusiasm for the flip side, the appropriately sad and dreary song "Life is Sad and Dreary". Tin Pan Alley at least tried to capture the sounds of the day, and this sounds like any number of hit songs of the era, without sounding like it would ever have been a hit, itself. And this does seem like a slightly better match for Gus Colletti's supposed skills than the rave up on the flip side. By the way, in sending me all of these treasures, along the way, Andy sent me a record that has become easily my favorite "new-to-me" record, one that I've heard for the first time and can't get enough of, in at least the last five or six years. It's called "Love in Return" by the Nightingales. This is close to a perfect record. I love the wild drumming, the struggle the girls have to stay on pitch and in unison several times during the song, and the bridges are particularly magical to me, and only the presence of a dumb-guy vocal at the end of each of those bridges keeps me from thinking this to be among the best things ever released. This was a cover of a release on a larger label. I've heard that one, too, and it has absolutely none of the charm and magic of this record. The really captured lightning in a bottle here. 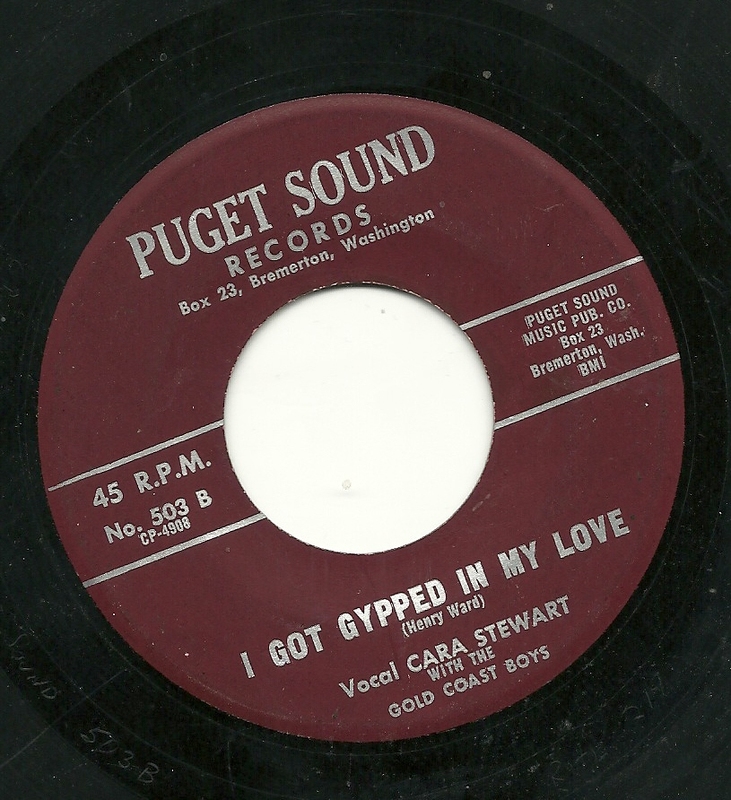 The SOUND of Puget Sound! Earlier this week, I spent a wonderful day with my best pal Stu, with whom I've also shared a love of, and a passion for collecting, song-poems. We dug through my unshared s-p records, as well as the pile of records I haven't even had a chance to listen to. From this latter pile came one of our choices for an upcoming offering, and I chose to make it today's record. It's from the Pacific Northwest. Bremerton, Washington, is just a 55 minute ferry ride from Seattle across the Puget Sound, and is the home to the Puget Sound Naval Shipyard. 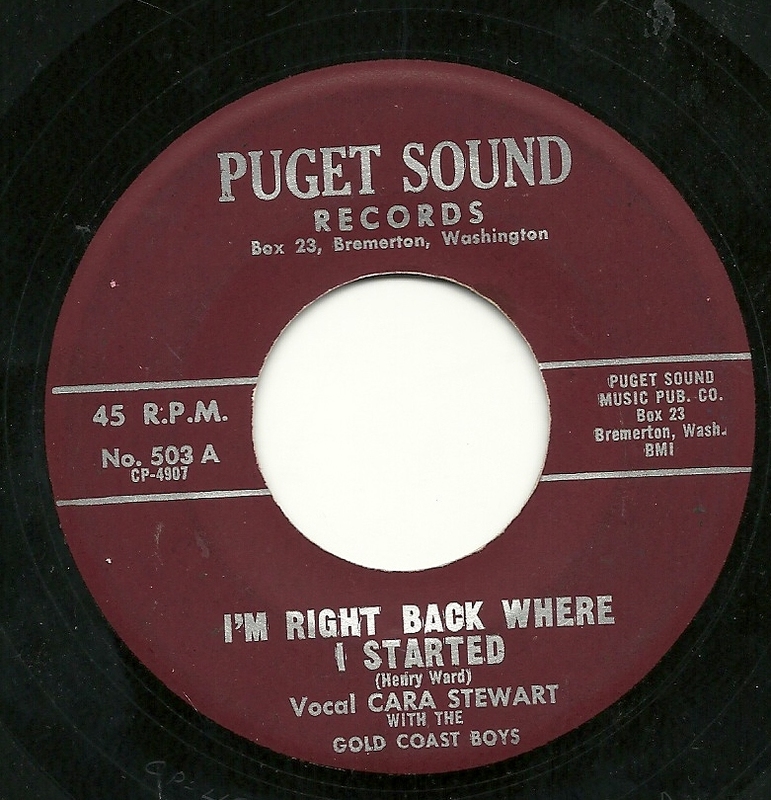 It seems at least likely that this town of 40,000 (today - it was closer to 30,000 in the '60's) was home to Henry Ward, who just as likely was the proprietor of Puget Sound Records. This is the only record I've ever seen on Puget Sound records, but the label number (503) leads me to believe that there were at least three others. For at least this record, Ward contracted to have Lee Hudson work his magic with his lyrics, and this resulted in the lovely voice of Cara Stewart singing the plaintive song of frustration, "I Got Gypped In My Love". And as with most of Cara's records, it's a lovely thing to hear. I'd also like to point out the audible dips heard during part of the guitar solo, where it sounds like someone put a finger on the turntable, repeatedly. Those moments are part of the record - I played that section three times, on two turntables, and it played like that every time. The flip side (actually, this is the A-side, but I liked "Gypped" a bit better), also written by Henry Ward, is a nice one, too. This has the same groove, same sound and same style of vocal - Lee Hudson's styles were somewhat limited, although they are such winning sounds that I hardly mind hearing them over and over again. I hope it's the same for you.